Why is Push Press so effective? Push Press, also called Overhead Push Press exercise is a power training or explosive exercise to develop deltoid strength and Muscle mass. Benefits of Push Press Exercise - Push Press exercise is actually a power move and a cheating principle used by power lifters and bodybuilders alike to build shoulder Mass and strength. This exercise is done standing with a heavily loaded barbell or two dumbbells. 1. Stand straight holding a barbell or two dumbbells at shoulder level. 2. Bend your knees and press the bar with the leg muscle strength in an explosive manner to raise the barbell or dumbbells overhead. This small cheating movement will help lift additional weight than normal shoulder presses. 3. Now lower the bar under controlled tension as if you are pulling the barbell or dumbbells down and repeat. Here are all the 3 positions together. 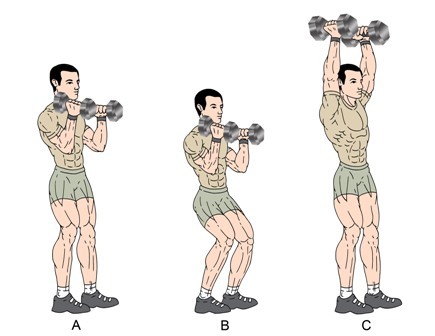 The bar or dumbbells should move from shoulders to overhead position in one clean motion explosively. Go as heavy as possible. More Killer Shoulder Exercises and Workouts - Clean and Press, Arnold Press and Shoulders Workouts. 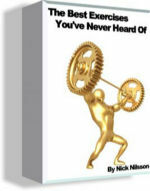 Just click here to find out 53 new innovative exercises to eliminate boredom, plateaus from your workouts and take your workouts to next level.